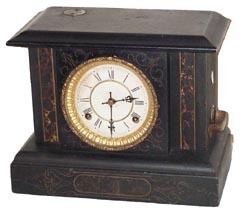 Waterbury Clock Co. "Gamblers Clock", in a regular black case adapted to accommodate the gambler movement and money slots. This case looks like the one in Ly-Waterbury No. 1162, almost 13 inches wide, 8 day regular movement, half hour gong strike. They described the case as "polished wood, gilt engraved".Gilt is OK, case a little worn on some edges. If I wanted to fiddle withit I could have used a black marking pen and covered those places. I wouldsuggest if you have always wanted one of the gamblers clocks, this is asgood as any of the 6-8 I have had, it just needs cleaning and servicing throughout.The backboard is suspect, but if it is a replacement it sure wouldnt botherme, it is nice. 2 of the 4 little wood feet are poor replacements.